When a single routine makes you one of the most talked-about gymnasts on the planet, it must be hard to turn away from it. 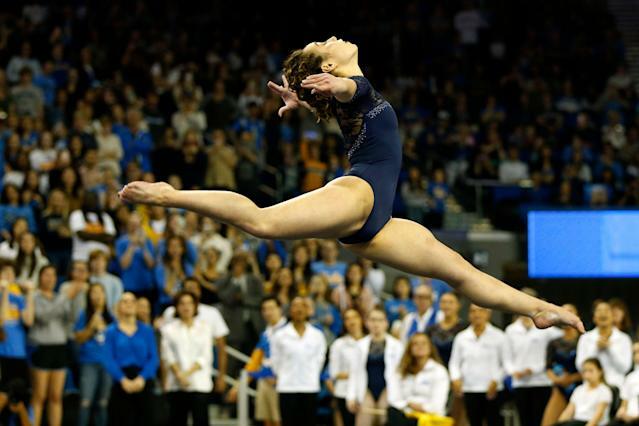 For UCLA’s Katelyn Ohashi, however, it was something she felt she had to do. Ohashi’s floor routine went viral in January when it earned her a perfect 10.0 through a mixture of expert tumbling and joyful choreography set to several hit songs, including a few from Michael Jackson. However, that routine went sour for her upon the release of “Leaving Neverland,” the HBO documentary that has revived a backlash against Jackson over his sexual abuse allegations and triggered a reassessment of the deceased pop star’s legacy. Now, Ohashi has told espnW that she will feature a new floor routine at the Pac-12 Championships beginning this Saturday, with no songs from Jackson featured at all. Even without the context behind her new routine, Ohashi is the gymnast to keep an eye on at the Pac-12 and NCAA Championships. She’s the defending national champion in the floor exercise, and ranked No. 1 in the country again heading into the postseason.